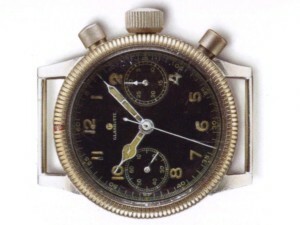 On the outbreak of World War I, the market for expensive precision watches collapsed virtually overnight. A decade of turbulence and upheaval was to follow. In 1926, the situation in Glashuette was desolate. 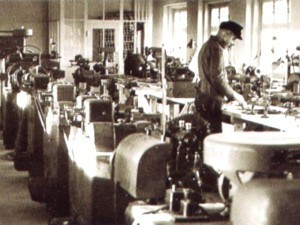 In December 1926 Uhren-Rohwerke-Fabrik Glashütte AG – UROFA – and Uhrenfabrik Glashütte AG – UFAG were set up, headed by attorney Dr. Ernst Kurtz. 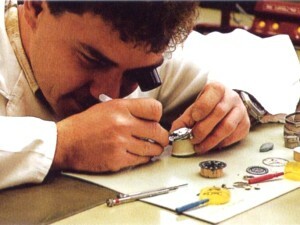 Apart from the initial production of superior quality pocket-watches, under the management of Mr. Kurtz and a few competent associates, the companies developed and produced their own ebauches for wristwatches. The top quality models were entitled “Tutima”, a brand name chosen with good reason. The founders had derived the name from the Latin adjective “tutus”, which translates as “safe” or “protected”. The product quality and the distribution exclusively through selected dealers soon earned Tutima an excellent reputation. Back then UROFA-UFAG had some 1000 employees. On May 8, 1945, just hours away from the cease-fire of WWII, Russian bombers wreaked havoc over Glashuette, severely damaging the metropolis of German watchmaking skills. Under the East German government, the factories were later merged into a state-owned combined production plant and the famous Glashuette trade names vanished from the face of the watches. 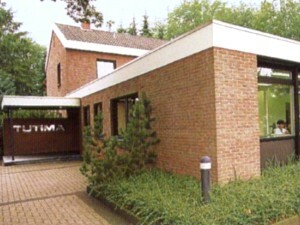 Tutima, however, survived and found a new domicile in West Germany. 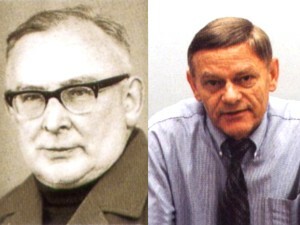 Coincidence or not: Dr. Ernst Kurtz, successful head of UROFA and UFAG, had packed his belongings and left Glashuette just one day before the terrible bombings. In 1951, the company moved to Ganderkesee in Lower Saxony. Together with former Glashuette employees, Kurtz picked up where previous developments had left off. The inscription “Kurtz Glashütter Tradition” on the dials unequivocally announced their intention of maintaining the watchmaking standards of the past. This was not just an empty boast. 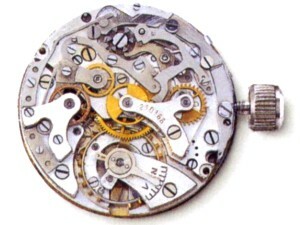 As early as 1949, one of several new developments launched by the company was the fine 11½-ligne traditional caliber “Kurtz 25″, which featured elaborate details such as chaton-set jewels, “super shock resist”-system and Breguet hairspring. By 1956, the promising, less expensive 5¼-ligne caliber Kurtz 570 was ready to go into series production. By that time, however, the financial resources of Dr. Kurtz were exhausted. But the brave entrepreneur’s project had already taken root in Lower Saxony. A new generation of watchmakers, trained in keeping with the strict principles of Glashuette traditions, had meanwhile come of age. 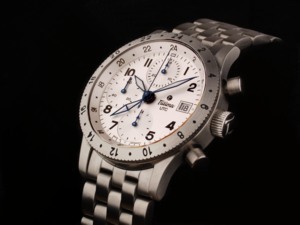 Werner Pohlan, former associate and close friend of Dr. Kurtz in Glashuette, continued to run the company under the name NUROFA – Norddeutsche Uhrenrohwerkefabrik, alongside a previously founded distribution company, TUTIMA UHREN. The historic name of Tutima celebrated a comeback in Lower Saxony. In 1959 Dr. Kurtz resumed management of the movement factory, giving it the venerable name UROFA, after the factory which he himself had founded and which no longer existed in Glashuette. In the years 1958/59, NUROFA / UROFA produced the remarkable number of around 70,000 ebauches of caliber 570. Just one year later, ebauche production was finally discontinued. The same fate, however, was not in store for the watchmaking sector nor for the name of Tutima. The survival of the production and the name of Tutima are due to an entrepreneur and former associate of Dr. Kurtz, Dieter Delecate. 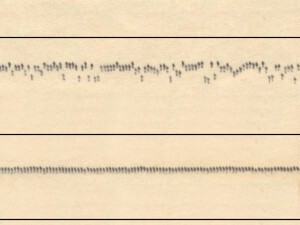 Having taken over the branch of “Tutima Uhren”, Mr. Delecate continued watch production with movements from other sources. The difficult times of the 70s, when the advent of quartz watches forced many European watchmakers to close down, were successfully circumvented and it was not long until the complex mechanical watch enjoyed a revival at Tutima. The year 1985 saw the launch of the mechanical Military Chronograph 798, specially developed by Tutima on behalf of the Germany Army and standard equipment for the German Air Force pilots ever since. 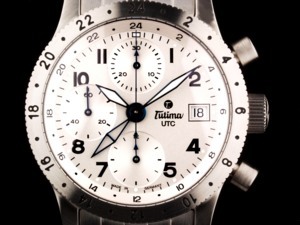 The two basic lines that determined the models in the Tutima collection since then, the Military Line and the Classic Line were amended by the new FX Line. 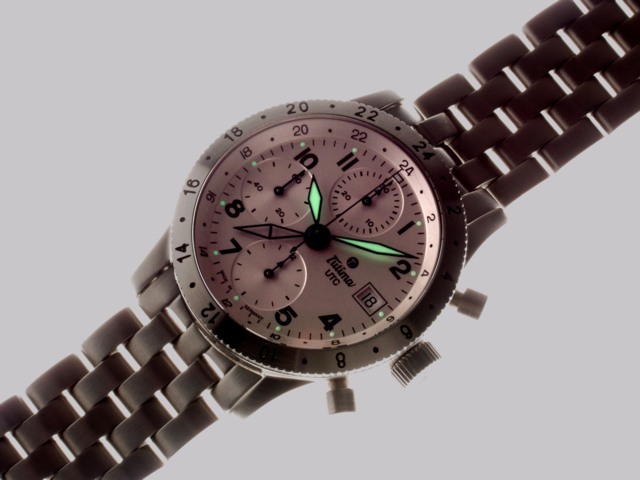 The FX line comprises a broad range of models that vary from simple hours, minutes, seconds, day-date to the more complicated Chronograph UTC. First announced for the Basel show in 2001, all FX models are now finally available with black and silver dials. The variety gets even broader as all models are available with various bezels: plain brushed finish or bi-directionally rotating 24h or 60 minute countdown partition. The roughly 50 employees of Tutima create precise timepieces mostly housed in stainless steel cases and driven by ETA based movements. There is little known about the work Tutima does on their movements. The company distributes no press information on the modules used or finish done. In general, the company’s attitude towards outbound communication could be best described as ‘Nordic’. 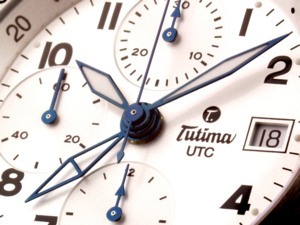 Producing their watches in Ganderkesee in the vicinity of the North-German city of Bremen, Tutima certainly takes a local exception to the German watch industry that is mainly based around Glashuette and Pforzheim. 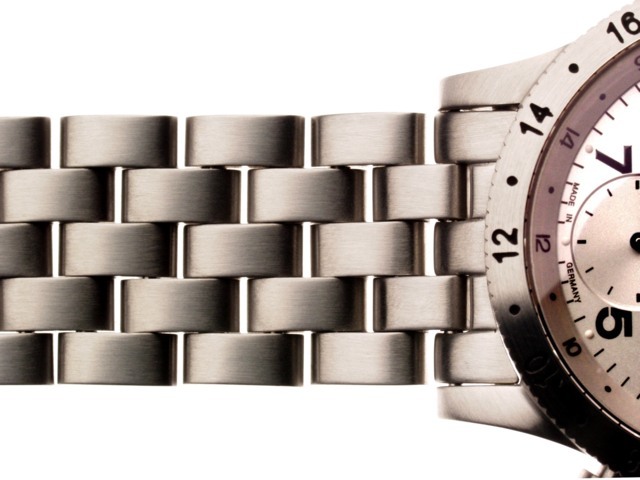 Over 150 grams of brushed stainless steel; the element this clearly technocratic watch is made out of. 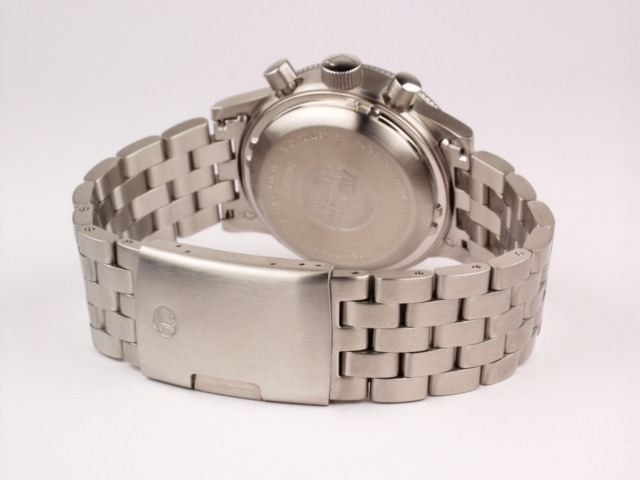 Part of this hefty weight certainly goes to the stainless steel bracelet which is further discussed below, yet the entire appearance of the watch is probably not best described as ‘light’ anyway. 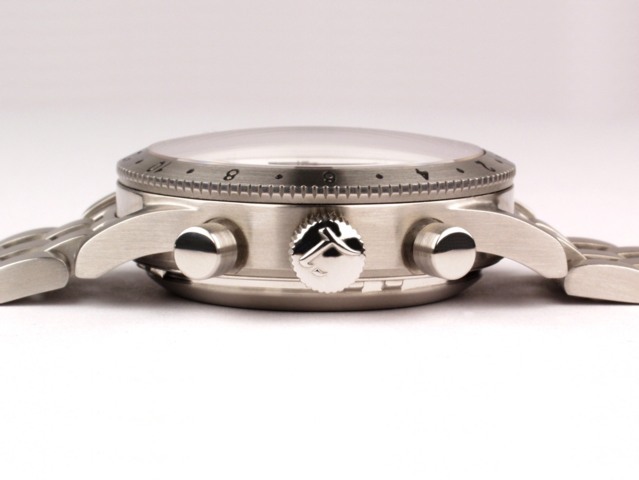 Besides the face of the pushers and the crown as well as a narrow rim on the case back, the watch is finished in finely brushed steel in its entirety. The absence of gleamy polishing adds to the rather unobtrusive appearance of the chronograph. At 38mm, the watch has a rather moderate diameter, sort of contradicted by the height of 14mm (plus an additional millimetre for the domed crystal). All in all, the watch doesn’t look too bulky even on a 6.5″ wrist. The relatively short lugs (lug to lug dimension is 46mm) certainly underline a solid wearing comfort. The screw down case back features a number of parallel nibs to match with the special opening tool. If there is anything like a ‘reverse side of a watch’ aesthetic, this little detail would distract from the clarity of the overall lines. From critique like this, you could tell that there is very little to complain about the case design of the FX Chrono UTC. The form simply follows function and is executed in a technically impeccable manner. The middle part of the case clearly looks like milled out of a hefty chunk of steel and the way the lightly swung lugs are cut and look like floating out of the case completes the massive looks. Tiny little imperfections in the surface tell that there is a lot of manual labour involved in the finish of this case. A fact that rather adds to the attraction of the watch than counting as a disadvantage. 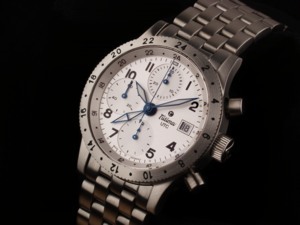 The bezel of the FX Chrono UTC is issued in three variations. The case is either not fit with a rotating bezel at all and instead just shows a brushed bezel as part of the main part of the case. Alternatively, Tutima adds a bi-directionally rotating bezel with either 24h or 60 minute countdown markers around the crystal. I chose the 24h bezel as this technically best suits the purpose of this functional watch and adds a third timezone function to the dual timezone complication. 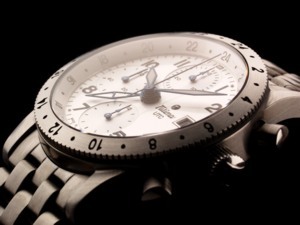 The turn of the bezel is firm in both directions and the raster of the 48 clicks around the bezel is precise and tight. The mushroom shaped chronograph pushers with polished faces and brushed gorge add a filigree touch to the case design. When pressing the buttons, the plunger fits into a slight recess at the side of the case. I personally prefer the more massive style of pushers that are bedded in a cylindrical shaft (as found e.g. in the Girard Perregaux F-300 Chronograph). However, such a design would not only be more difficult to implement but would also give the case a much bulkier look. The strong resistance that owners of Valjoux based chronographs are used to impairs the pleasure of operating the chronograph. The fairly large crown in turn is designed all to my satisfaction. 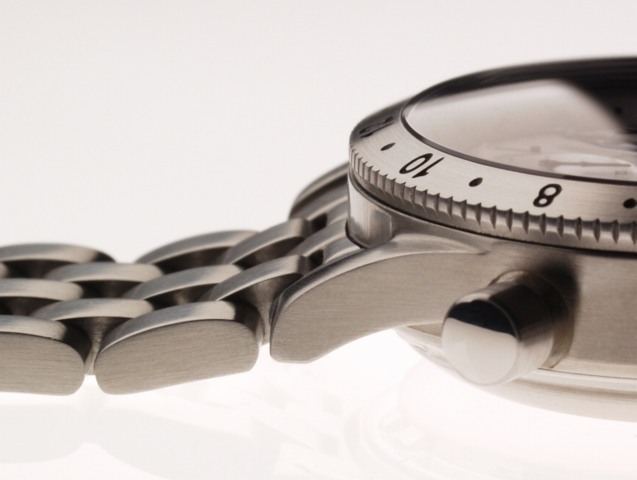 Its diameter and depth perfectly fits the overall size of the watch and guarantees hassle-free operation. It impresses me much that the crown not only operates with utter preciseness and smoothness but also needs more than four full turns to be completely screwed into the thread. Checking this fine technical detail is easy because of the neatly finished face of the crown that shows the T-logo of the brand. The sapphire crystal caters to the same goal of making the watch look less massive than it actually is. The domed shape meets the flow of the swung lugs and the rest of the case. In combination with the inside antireflective coating, the curved shape of the crystal enhances the legibility of the watch. The set of crystal-, case back- and crown/pusher-gaskets ensures a water resistance of 100m (approx. 330 ft.). We are basically talking about two different watches here. The black faced and the white dial Tutima FX line. Out of sheer personal preference I chose to have a closer look at the white face version. First introduced at the shows in 2001, the white Tutima Chronograph FX UTC was spooking around in watch magazines for two years. It was the same picture again and again that cached the reader’s attention. I was told by a Tutima representative that it was taken from the first prototype. It had a plain white face that almost looked like an enamel dial. Honestly, I was a bit disappointed when I learned that the final version would have a silvery finish instead of the spotless white. 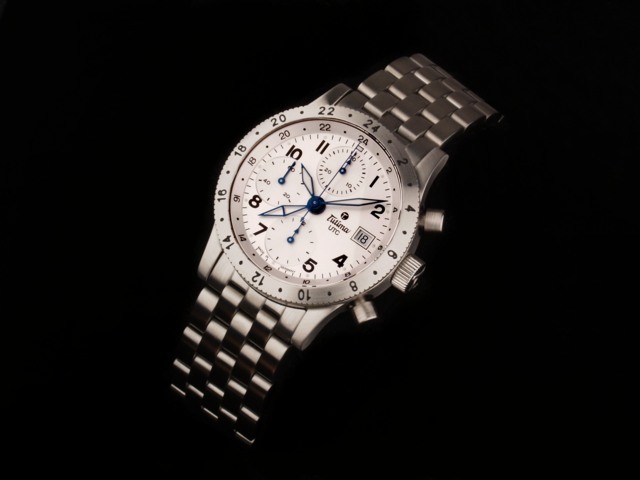 That was when I first saw the watch in person at the 2003 Inhorgenta show in Munich. 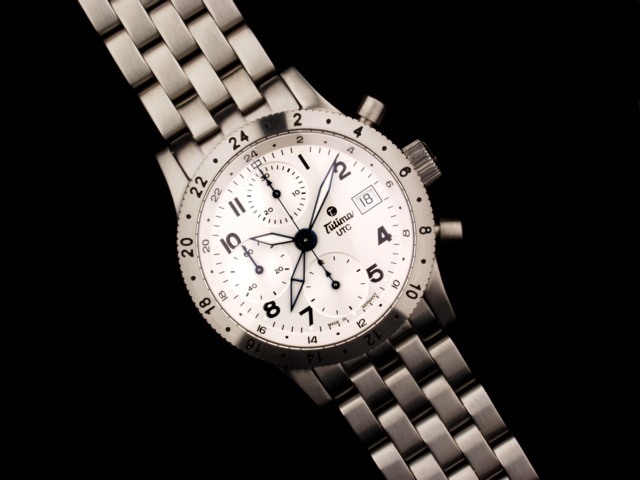 All in all, though, I still think that the white version of this watch is an extraordinary attractive candidate in the not so wide field of ultra-sporty chronographs with white dials. One word: Utter legibility! It might not be apparent from the pictures but the legibility of this watch, including all its functions is impeccable. The design is utterly clear and even though the dial has to comprise a number of complicated functions, it is everything but cluttered. 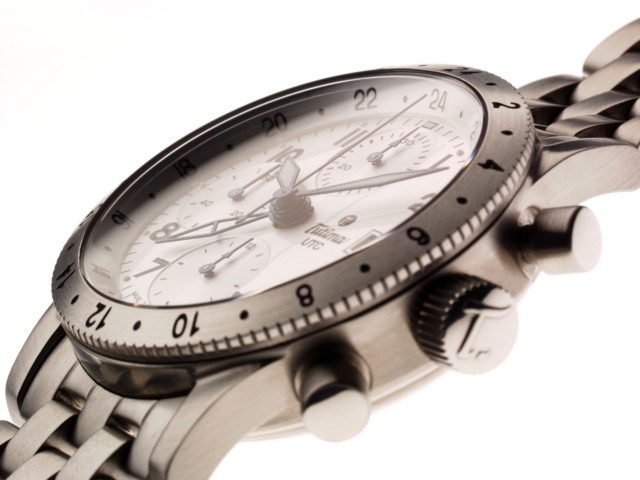 The overall layout is determined by the specifications of the Valjoux chronograph, i.e. subsidiary seconds at 9 o’clock, chrono subdials at 12 o’clock for the minutes and 6 o’clock for the hours, date window at 3 o’clock. The wonderfully filigree chronograph second hand as well as the skeletonized hand for the second timezone operate from the centre of the dial. All hands of the Chrono UTC are blued. The arrow shape hands of the chrono subdials are wonderfully executed. 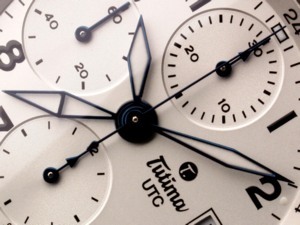 The frame of the lance shaped hour and minute hand is blued as well and filled with Superluminova. The skeletonized UTC hand shifts as precisely as the chrono hands and clearly indicates the different timezone as it has slightly larger dimensions than the regular hour hand. But again, the particularly narrow second hand is what strikes me the most. The dial print is nothing but perfect. 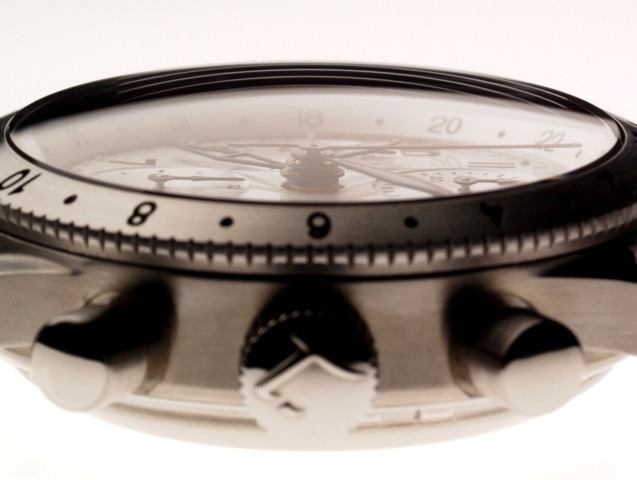 The heavy and glossy black print of the straight and utmost legible numerals almost gives the dial a third dimension. So do certainly the slightly recessed subdials with their concentric grooves. The minute tiny markers as well as the remaining print for the chronograph functions is as flawless as the company logo and the little imprint “Made in Germany” below the hour subdial at 6 o’clock. The additional 24h scale for the second timezone is placed on a bevelled shoulder around the dial towards the bezel. With the assistance of the markers on the rotating bezel, the FX UTC could display three different timezones. 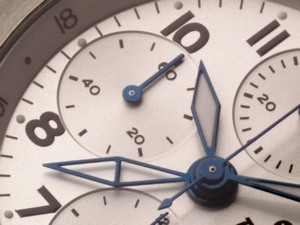 Theoretically, the watch could indicate a fourth timezone, given that the chrono features a 12h subdial at 6 o’clock. In addition to the Luminova coating of the hour and minute hand, the hour indicators (every fifth minute index) are fitted little Luminova dots as well. I wish Tutima would provide the world, respectively Timezone, with more details about the movement. Well of course, it is based on the omnipresent Valjoux 7750 automatic chronograph movement from ETA. But the again, somebody needs to add the second timezone module. 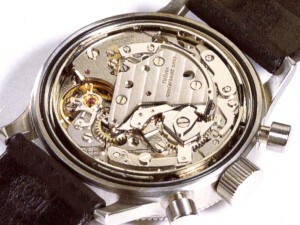 I am almost embarrassed that I couldn’t find out more about the inside of the watch. Just opening up the case back wouldn’t help as the second timezone module of course sits on the dial-side. This way, it is even up to speculation what exactly the refinish looks like that Tutima applies to the ETA base movement. Is it limited to engraving the company name on the rotor? Or are they completely disassembling all parts and give them a higher grade finish plus some cosmetic mark-up like Geneva stripes and blued screws? Questions yet to be resolved. In the meantime, we could just dwell on Walt Odets’ brilliant analysis of the Valjoux 7750 itself. Please have a look at his detailed article in the Horologium. 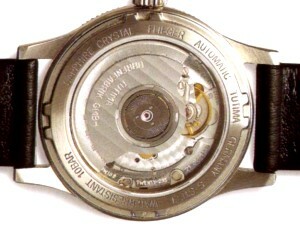 Part of the movement is also felt from outside without opening the watch. 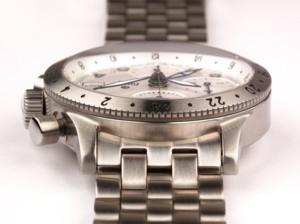 As mentioned before, the operation of the pushers is not as smooth as it should be on a chronograph. I assume that the reason is the coulisse-lever technique used in comparison to the much smoother column-wheel technique. Another disadvantage of this specification is the less precise start of the chronograph (centre) second hand. Like on most 7750 watches, the centre second hand at times does a little jump when it starts upon operating the pusher at 2 o’clock. 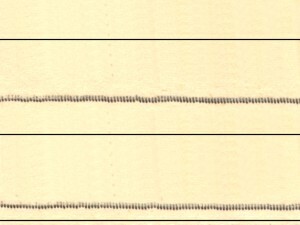 However, the frequency these jumps occur on the FX UTC as well as their deflection is rather minimal. That leaves me to assume that Tutima is actually doing quite a good deal of refinishing the movement. After a couple of days of dispersion of the oils, the FXC UTC ran at absolutely satisfactory preciseness. The last days I checked, it stayed within COSC specifications, mostly running at about + 1-4 seconds a day, regardless of the chronograph function running or not. Below, two pictures of the Tutima version of the 7760 and the 2892. 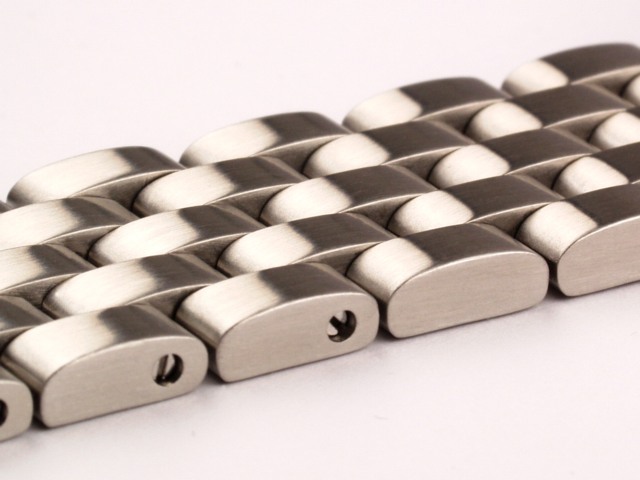 It is difficult to find a really good stainless steel bracelet and as such, the grade ‘good’ is to be understood as high praise. 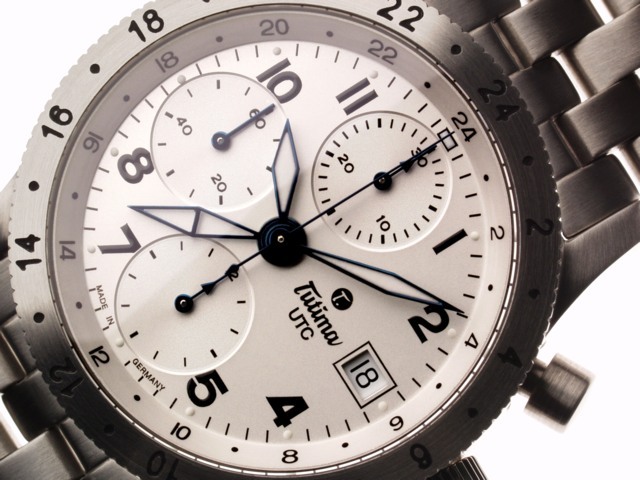 The bracelet of the Tutima FX line is ‘good’ in every sense. With regard to the style I would even dare say that it belongs to the nicest in the market (in the utilitarian class). 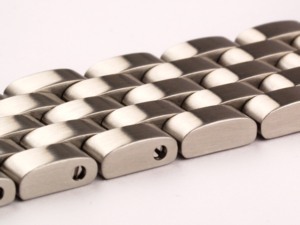 Starting from solid end links that fit tight between the lugs, an even floating band of completely brushed links smoothly nestles around the wrist. The links have just the right size and add to the wonderful wearing comfort. The length is easily adjustable with screw pins and a spring bar fine adjustment in the clasp. The only thing I could complain about is what I call side-clearance. If you ever handled an X-71 bracelet made by Blancpain, you know what I am talking about (I am sure there is others out there that I haven’t touched yet). The test is to put down the watch in crown down position on a flat surface with a fully stretched out bracelet as if the watch would sit on the wrist. If the bracelet doesn’t show any vertical bend caused by gravity, it passed the X-71 test. The Tutima bracelet fails (as much as for example the Rolex president bracelet would fail this really harsh test). The bracelet is held together by a mono pushbutton folding clasp. The mechanism of the clasp operates precisely and securely. Since the push button doesn’t stick out from the clasp (like the Omega push buttons do), there is no risk of accidentally opening the buckle. 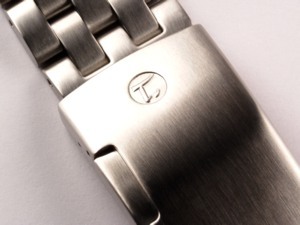 The brushed finish of the clasp is adorned with the Tutima logo already known from the crown. In closed position, the buckle fits the overall design and quality of the watch very well. However, once opened and unfolded, it simply looks cheap. Not very charming either are the boxes the watch is sold in. The plain cubic inner box is made from soft a soft leather-like material and held together by a zipper. A white outer card box adds another layer of protection. A somewhat more sophisticated wrapping would certainly do much better service to this nice watch. The packaging, even though surely meant to be a bit technical, just doesn’t correspond to the value of the timepiece. When I first saw a picture of the white dial version of the Tutima Chronograph FX UTC in the wrist watch annual 2001, I fell in love with this watch and knew that I wanted to get one as soon as they would become available. 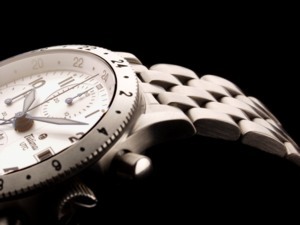 The watch came out two years later and what I assumed to be a truly white dial turned out to have a silvery finish. 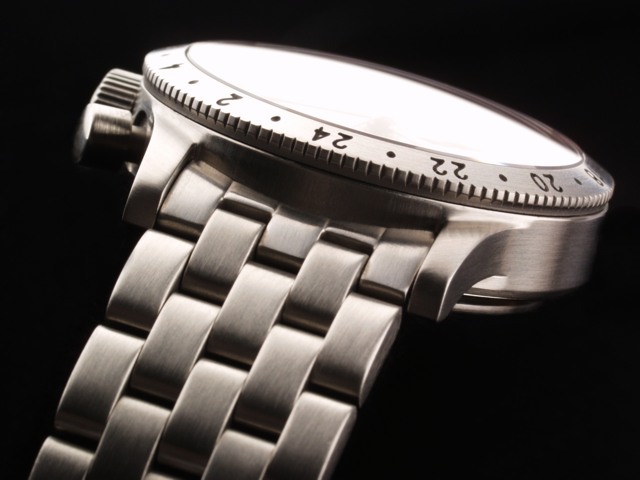 That initial disappointment was soon overcome by the overall quality, design, functionality and finish of the watch. 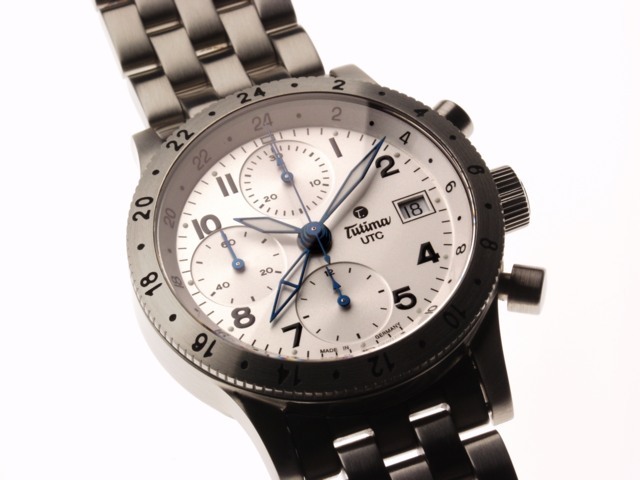 Tutima asked Timezone not to publish any prices, yet I can say that the price is certainly very competitive and thus, I think it is a lot of watch you get for your money when buying a Chronograph FX UTC. There are a few details that are really fun about this watch. Certainly its perfect functionality for the modern frequent flyer or barbecue master (timing the burgers) is one of them. 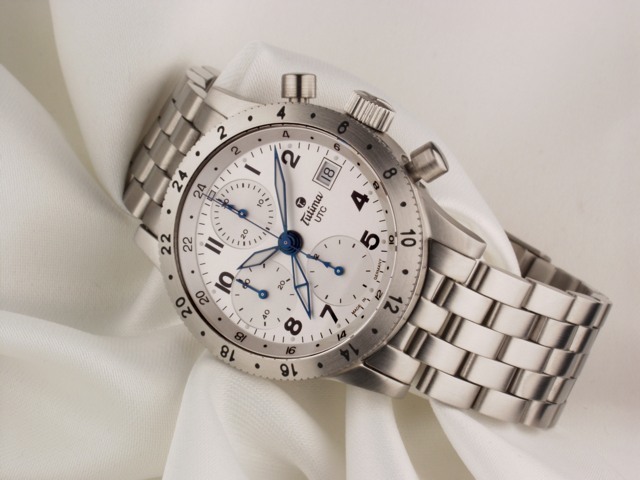 However, little things like the wonderful chrono second hand, the amply proportioned crown and again and again the top of the line dial print with all its detail and thick glance could make this watch grow on you more than you might expect from first sight.